Stephanie and Steven paint the perfect picture of the All-American couple. They are high school sweethearts. She was the Cheerleader, and he was The Football Player. They met at a party before the first big game of the season…(sigh)…sounds like those ‘Sweet Valley High’ books I used to devour when I was young! When it came time for this wonderfully cliché couple to get married, they decided to plan a winter escape from their hometown in Boston and set their sights on the beach wedding they had always talked about. 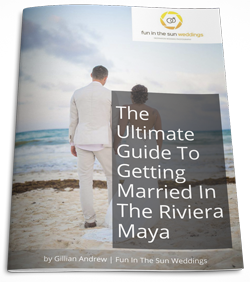 With help from their wonderful wedding planner, Amy Rubins of Fete Perfection, they chose to be wed in the sunny warmth of the Riviera Maya of Mexico. Stephanie had her beach wedding dress picked out a year before the wedding. It was beautiful. Lace, elegant, everything she thought she wanted. Then, three weeks before the wedding, she decided she didn’t like it anymore! Her Mom and sister flew up to Boston, and dealt with an hysterical bride as they went all over to find a new dress! It was the magicians at Bride N Belle Boutique, in Medford, MA, who were able to pull some strings and get her into a stunning, perfectly tailored wedding dress right at the zero hour! Rather than worrying about that which she could not control, Stephanie chose instead to spend the morning of her wedding day in a private yoga session with her girlfriends and bridesmaids. After that, the weather was beautiful. They knew their grandparents were watching over them because their reception ended at 11pm, and at 11:02pm, it started pouring! The wedding ceremony and reception were held at Secrets Capri Resort in the Riviera Maya, and provided the stunning ocean backdrop that the Bride and Groom had envisioned. They chose black, champagne and warm pink as their wedding colors, favoring an elegant beach wedding that was not too bright or loud. Stephanie and Steven, you were such FUN to work with, and we hope that life will always be a picture perfect cliche for the two of you! Congratulations! If you are looking for the best Riviera Maya wedding photographer, then contact us today! We are Fun In The Sun Weddings, the best photographers in Riviera Maya, Mexico. Want to know more about Secrets Capri? Read unbiased reviews on Tripadvisor here. ***AND HEY! If you love Steven & Stephanie’s photos, and happen to be looking for a Riviera Maya wedding photographer, then contact us today for a free consultation! Fun In The Sun Weddings were perfect for our wedding, and every event surround it! Mark and his team were professional, fun, and provided great energy for every event. We used them for our welcome party bonfire, our wedding and we did a trash the dress photo shoot the day after the wedding. We couldn't be happier with the photos that were taken. They were able to capture every important moment, and every special shot I requested. Their use of two photographers proved very valuable in that they were able to capture multiple angles at one time. They were so fun, and all our guests were so comfortable working with them. 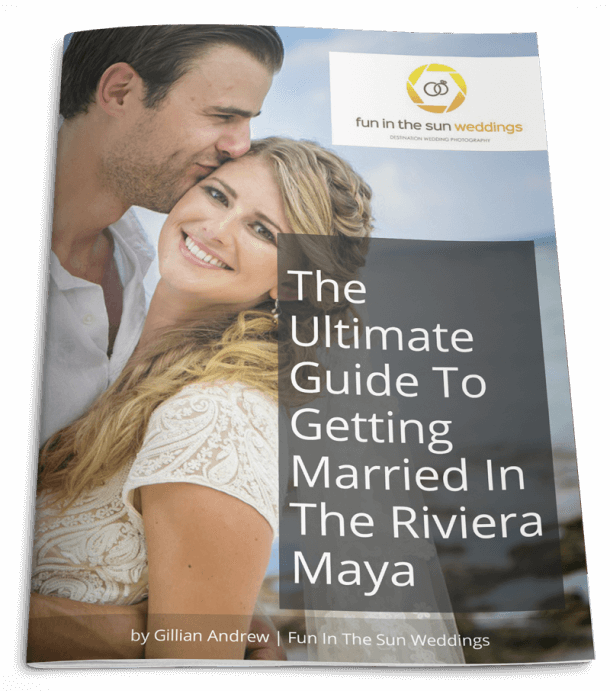 I would HIGHLY recommend Fun In The Sun Weddings for your Mexican wedding!